The Palmako Carmen 7 Summer House is a perfect octagonal (8 sided) summer house which features 7 x large double windows and 1 x double door offering a very bright and airy summer house. A simply perfect feature in the garden as well as offering many practical uses. A superb value and stylish addition to any garden. 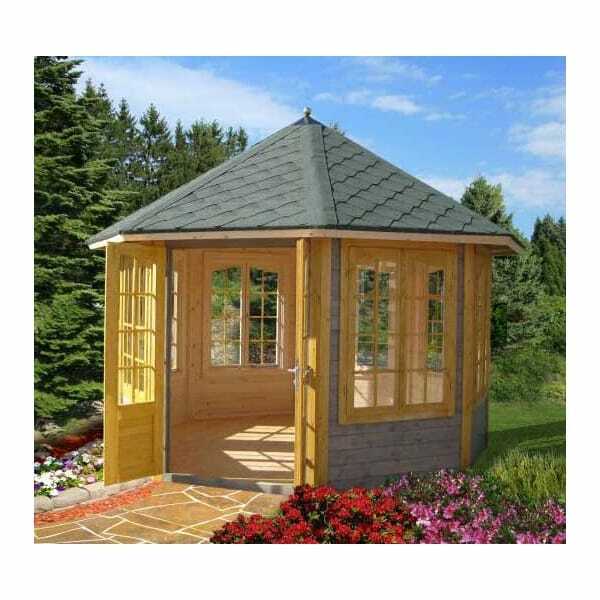 The summerhouse can be supplied with optional Bituminous Felt (Shed Felt) Roofing or Roof Shingles in either Green / Black. In Common with most timber outdoor buildings, this summer house is delivered untreated and will require the application of a good quality timber preservative. THE CABIN IS DELIVERED IN ITS NATURAL WHITE WOOD.